Frédéric François Chopin (French pronunciation: ​[fʁe.de.ʁik ʃɔ.pɛ̃]; 22 Februar or 1 Mairch 1810 – 17 October 1849), born Fryderyk Franciszek Chopin,[n 1] wis a Romantic-era Pols componer an virtuoso pianist o the Romantic era wha wrote primarily for the solo pianae. He gained an haes mainteened renawn warldwide as a leadin muisicker o his era, whase "poetic genius wis based on a professional technique that wis withoot equal in his generation." Chopin wis born in whit wis then the Duchy o Warsaw an grew up in Warsaw, which in 1815 acame part o Congress Poland. A bairn prodigy, he completit his muisical eddication an componed his earlier warks in Warsaw afore leavin Poland at the age o 20, less nor a month afore the ootbreak o the November 1830 Uprisin. At 21 he settled in Paris. Thareefter, during the last 18 years o his life, he gae anerly some 30 public performances, preferrin the mair intimate atmosphere o the salon. He supportit himsel bi sellin his composeetions an bi teachin pianae, for which he wis in heich demand. 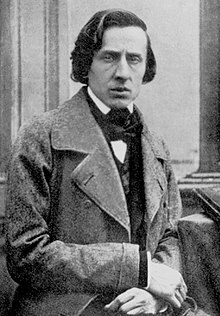 Chopin formed a friendship wi Franz Liszt an wis admired bi mony o his muisical contemporaries, includin Robert Schumann. In 1835 he obteened French ceetizenship. Efter a failed engagement tae Maria Wodzińska frae 1836 tae 1837, he mainteened an eften truibbled relationship wi the French woman writer George Sand. A brief an unhappy veesit tae Majorca witSand in 1838–39 wis ane o his maist productive periods o composeetion. In his last years, he wis financially supportit bi his admirer Jane Stirling, wha an aa arranged for him tae visit Scotland in 1848. Throu maist o his life, Chopin suffered frae puir health. He died in Paris in 1849, at the age o 39, probably o tuberculosis. Aw o Chopin's composeetions include the pianae. Maist are for solo pianae, tho he an aa wrote twa pianae concertos, a few chaumer pieces, an some sangs tae Pols lyrics. His keybuird style is heichly individual an eften technically demandin; his awn performances war notit for their nuance an sensitivity. Chopin inventit the concept o the instrumental ballade. His major pianae warks an aa include mazurkas, waltzes, nocturnes, polonaises, études, impromptus, scherzos, preludes an sonatas, some published anerly efter his daith. Influences on his composeetion style include Pols fowk muisic, the clessical tradeetion o J. S. Bach, Mozart an Schubert, the muisic o aw o that he admired, as well as the Paris salons whaur he wis a frequent guest. His innovations in style, muisical form, an harmony, an his association o muisic wi naitionalism, war influential ootthrou an efter the late Romantic period. Chopin's muisic, his status as ane o muisic's earliest superstarns, his association (if anerly indirect) wi poleetical insurrection, his luve life an his early daith hae made him a leadin seembol o the Romantic era in the public consciousness. His warks remeen popular, an he haes been the subject o numerous films an biografies o varyin degrees o historical accuracy. ↑ In Pols, pronoonced [ˈʂɔpɛn], wi alternative, phonetic spellin Szopen.